A level uses a bubble floating in a liquid-filled tube to indicate whether something is parallel or perpendicular (or, in some models, at a 45° angle), to the ground earth's gravitational field. 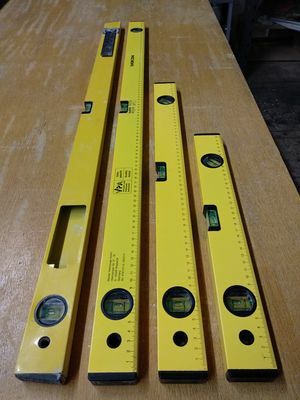 When mounting something, that means if the floor or wall nearby is not perfectly straight, your measurement will be - so there could be applications where you'd rather go for a line parallel to the existing geometry than the "true" measurement obtained with a level. Given the proper conditions you can also check squareness of pieces against each other in two dimensions, but a square is the proper tool for this kind of task. Small magnetic or clip-on levels can be very handy if you have a straight reference (e.g. your workpiece or a tensioned string) to attach it to. This page was last edited on 25 March 2019, at 20:40.